You’ve probably noticed that monthly subscription boxes are all the rage, and Julep hopes you’ll like their concept enough to give them a try. Julep asks you a series of questions before assigning you one of four style profiles, on which they’ll base your welcome box as well as all future monthly deliveries. However, you have the option of logging into Julep’s Web site near the end of each month and making changes to your upcoming monthly assortment of items. You can also choose to specify an alternate recipient for your box, should you wish to send it to a friend as a gift. Julep offers two tiers of monthly boxes – My Maven, costing $24.99 a month and including $40 worth of polish and product, or Maven Luxe for $39.99 a month with $60 worth of “prestige” products. Wondering what comes in a Julep box? The “My Maven” Julep package which I received contained two Julep nail polishes, 0.27 ounces each, and a 3-ounce Julep Rock Star Hand Creme. The hand cream and nail polish seem to be of good quality. The nail polish stays on very well, even without using a base coat. I took advantage of a deal from Swagbucks to get a My Maven box for just the cost of shipping – less than $3. To take advantage of this offer, I did have to enter a credit card number. 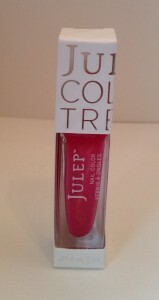 My subscription will continue, with my credit card charged monthly, until I call Julep to cancel. Julep doesn’t offer an option to cancel online or via email. Julep also doesn’t accept returns of monthly box items, so if you sign up, you’ll want to make sure you add a reminder to your calendar to login at the right time of each month to see what’s in your box and customize it, if you want. Entertainment coupon books $9.99 with free shipping!